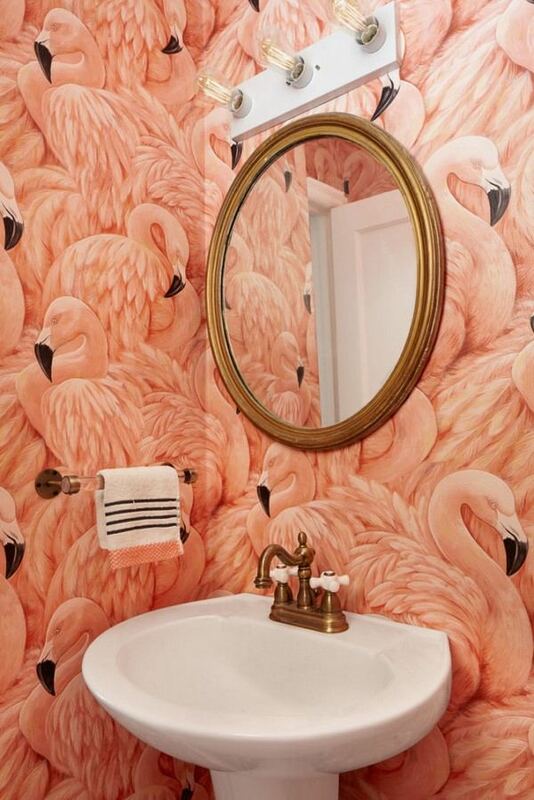 How to choose bathroom wallpaper? The bathroom is a place with its own micro-climate and one of its main features are the constant high humidity and temperature changes. When planning the design of the bathroom people traditionally prefer a time-tested solution – tile. For decades, homeowners believed that there is nothing better than ceramic tile for finishing a bathroom because of its resistance to moisture, strength and a variety of texture. However, times are changing and with technology development, designers and manufacturers offer a new, modern, exclusive and affordable alternative. We would like to focus your attention on wallpaper. 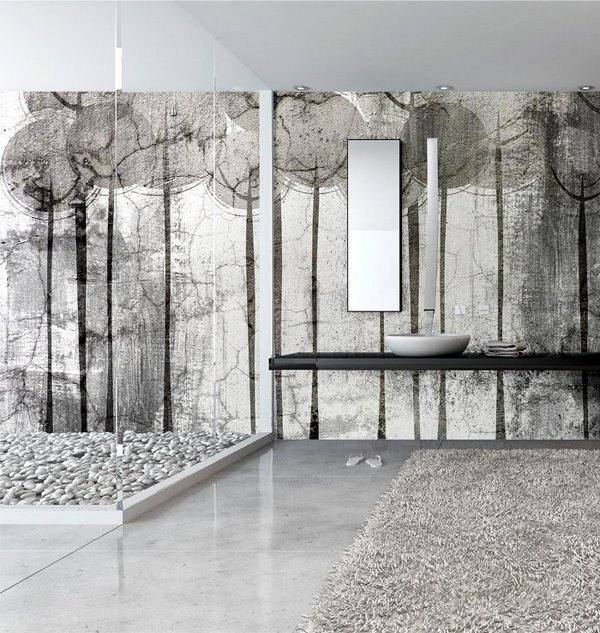 As unexpected as it may sound, modern wallpapers are almost as good as tiles and give you the chance to create an exclusive, original, stylish and elegant bathroom design which will reflect your taste and lifestyle. The bathroom is very different from other rooms in the apartment. 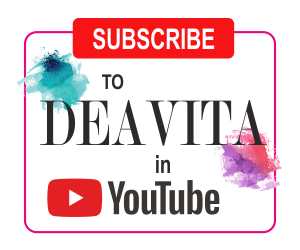 It is a place that we use daily and besides being comfortable and functional, it is also the place for rest and many people love a long, relaxing bath in the evening after a hectic day. 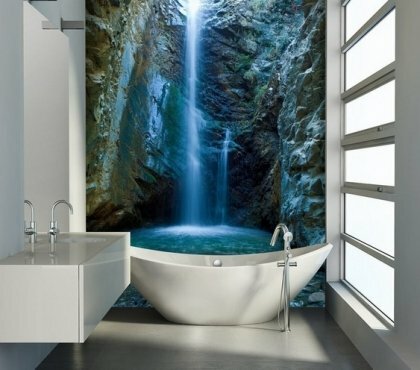 Creating the right design is important as each and every one of us would like to have a beautiful bathroom. Choosing wallpaper to finish the walls is the easiest way to arrange a SPA-like appearance and atmosphere, a romantic or a contemporary look. Of course, you need to know the pros and cons of the different types of wallpaper and how to use them properly. 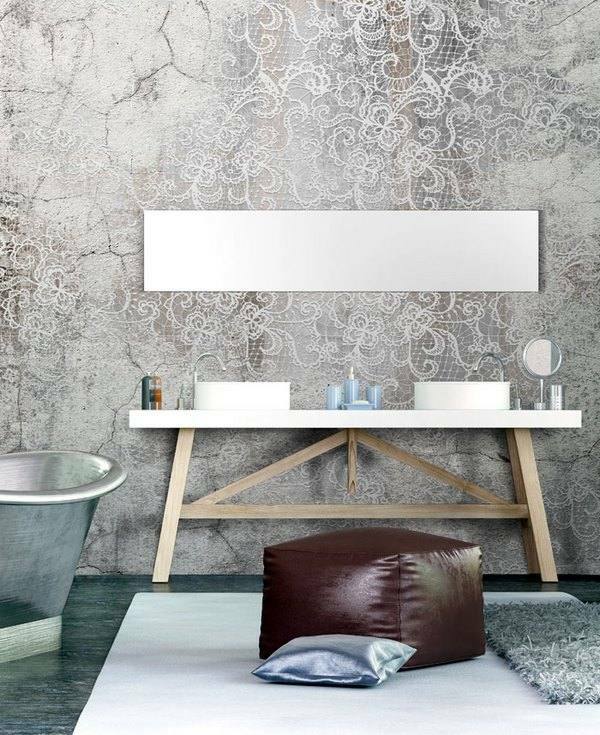 Versatility – Wallpapers can be used for any decor style and are easily combined with other materials and types of finishes. They look good with plastic panels, wainscoting or ceramic tiles. In addition, they can be painted in any color. Easy installation – you do not need special skills and experience to hang wallpaper. 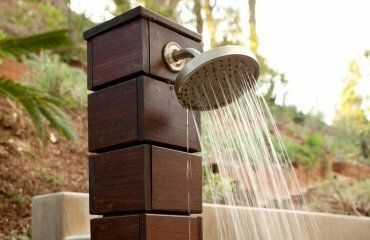 This is an excellent DIY project because the work is not very difficult and you will save money on labor. 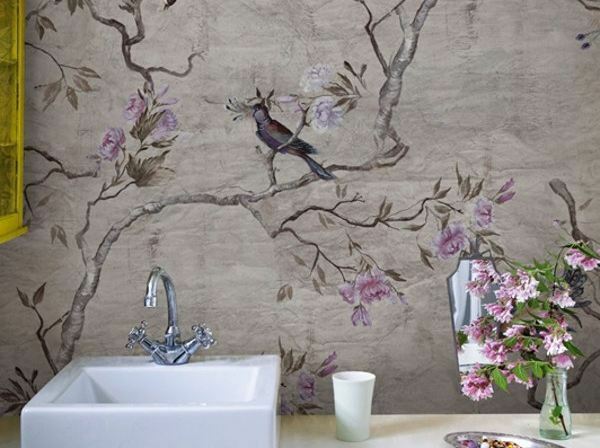 Moreover, the walls do not require a special preparation, the wallpaper can hide minor irregularities of the walls. 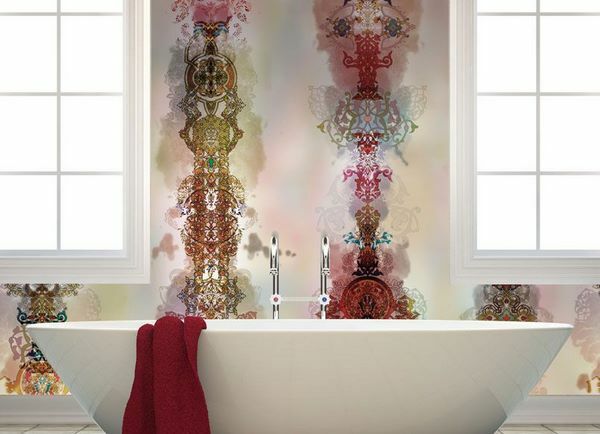 Visual appeal – wallpaper comes in unlimited varieties, textures, patterns and colors and you can use it to visually increase or decrease the size of the bathroom. 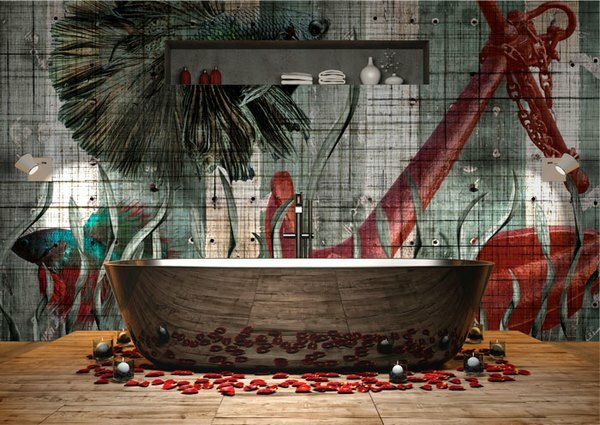 You can create a stunning art wall or an accent wall in the bathroom, depending on the design concept and your personal taste. Maintenance – wallpaper finish will significantly reduce the cost of repairs in comparison with tiling. Removing and replacing them is much easier which allows you to update your bathroom interior without going through the dusty and dirty process of getting off the tiles from the walls. Minor repairs are also an easy task which does not require large financial cost and great efforts. You can replace a damaged part in a couple of hours. Price – Depending on the budget, you can choose either more expensive or a budget friendly option. One of the main drawbacks is the possibility of swelling and peeling off, as wallpaper is in a constant contact with water and high humidity. Appearance of mold is another disadvantage which requires immediate removal of the wall finish and anti-fungal treatment. 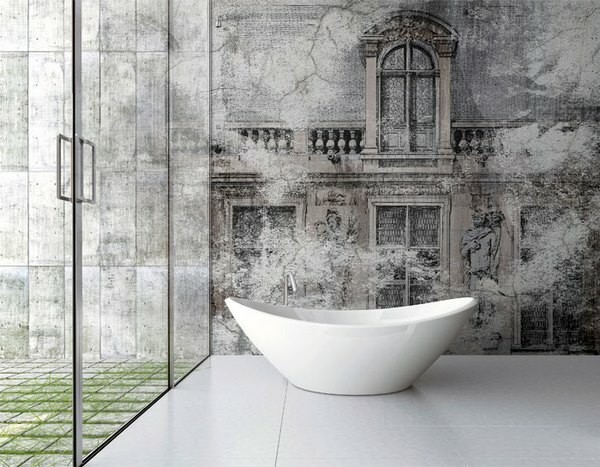 How to choose the right bathroom wallpaper? 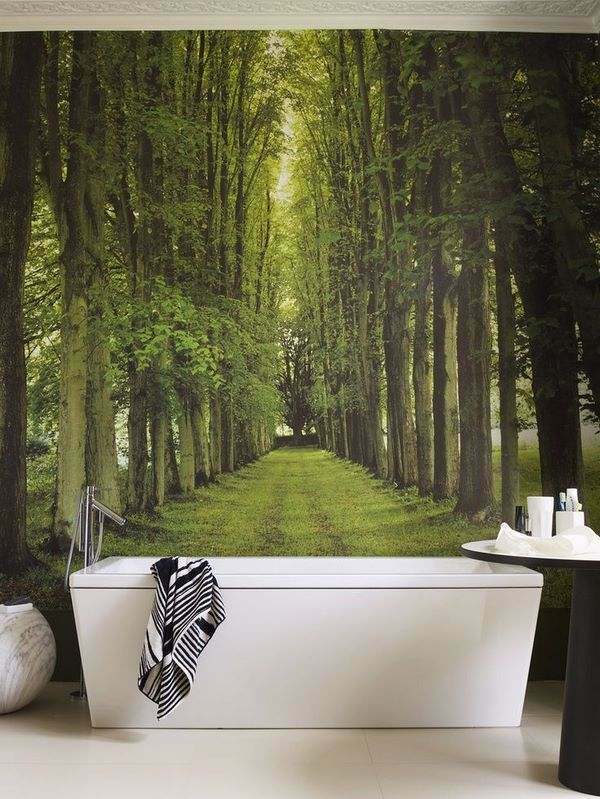 High quality wallpapers for bathrooms are manufactured with increased water and water resistance and are designed to withstand frequent changes in temperature and moisture. They are impregnated with special solution that prevents the appearance and reproduction of fungi. 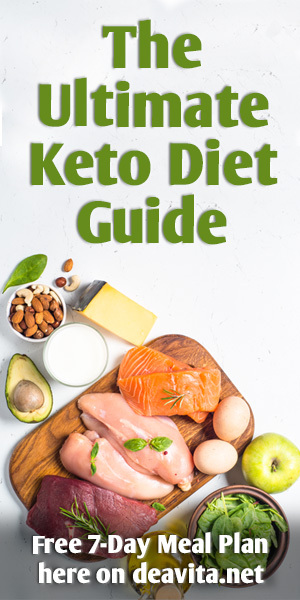 There are several options to choose from and we shall give you some useful tips that will help you make the best choice. 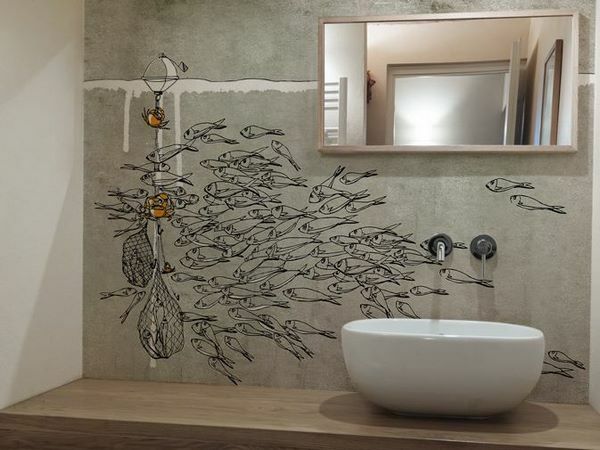 Peel and stick wallpapers are the simplest and cheapest material for decorating the walls of the bathroom. You need to make sure that you buy water resistant wallpaper. The advantages are that they come in numerous colors and patterns and the installation process is quick and easy. Washable wallpapers are made of paper-based material with a waterproof film (thin plastic transparent coating). It helps to withstand high humidity and maintains an attractive appearance of the wallpaper. The coating also prevents staining and allows you to use a sponge or a damp cloth to easily remove dirt, fungus or dust, which is especially important for maintaining the hygienic requirements in the bathroom. 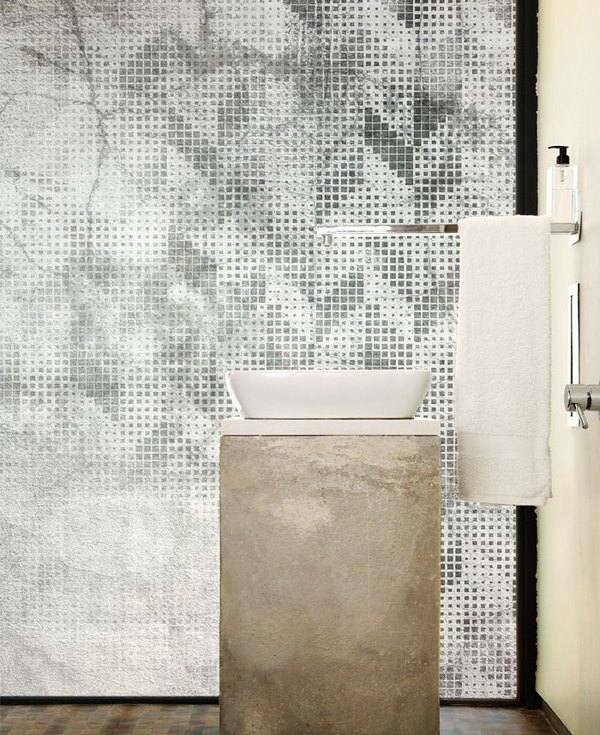 Washable wallpapers can be applied to any surface – concrete, plaster, paint – and offer a long service life. They are easy to hang and remove, easy to maintain and as far as price is concerned, this is the most affordable option. The market offers several types which differ in the degree of moisture resistance. Check for the international wallpaper symbols for cleaning – spongeable, washable, extra washable, scrubbable and extra scrubbable. Spongeable wallpaper is not intended for active washing and will withstand only a little moisture. Washable options can withstand washing with mild detergents while extra washable have high strength and water resistance and can be washed with more aggressive cleaners. Products that are marked as scrubbable and extra scrubbable can be treated with strong cleaning agents and cleaned with a hard brush. 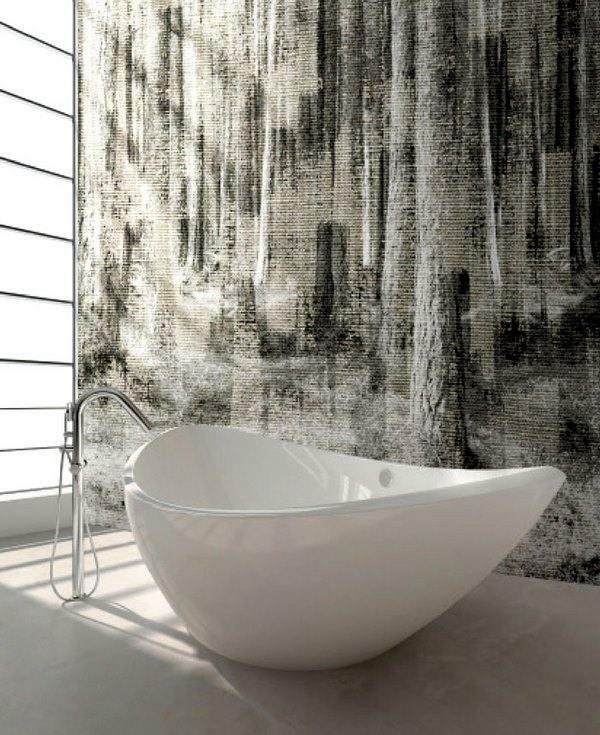 Vinyl wallpaper is one of the most popular solutions when choosing wallpaper for the bathroom. They are manufactured to not only resist steam, temperature and moisture, but even direct contact with water. The main advantages of this option are that these wallpapers are very durable, they will retain their original appearance for a long time, they are easy to clean and maintain as they are washable. The variety of colors and patterns is huge and due to the fact that this wallpaper is dense, it is a great choice when you want to hide unevenness of the walls. There is a vinyl coated variety which is different from vinyl wallpapers, as the coating is very thin and the backing is paper. Vinyl wallpaper is more durable than the vinyl coated variety and performs much better in areas where high humidity is common. A major drawback is the relatively high price and the fact that if you decided to strip vinyl wallpaper, this can be hard as it is impervious to water. 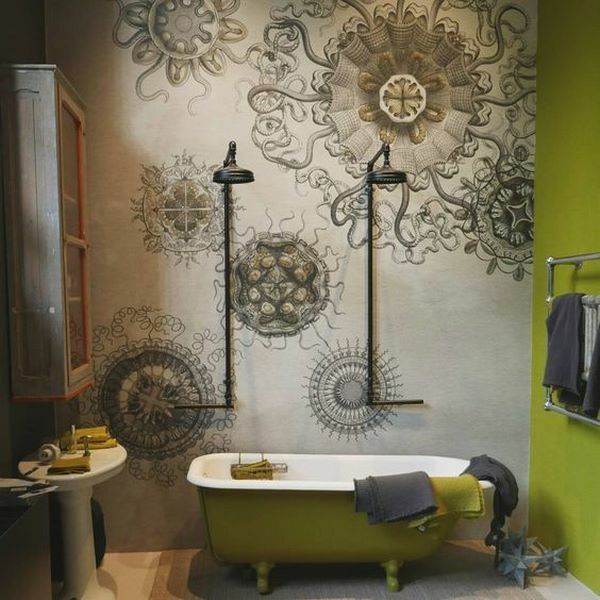 Liquid wallpaper – this option is often considered as a decorative plaster as it is an emulsion or powder that has to be mixed with water and contains binding components, cotton and silk fibers, mineral additives or glitter. It can be applied to any surface like concrete, drywall or brick with the help of a roller or spray gun and comes in a wide range of colors and textures. Once applied on the wall and treated with a special acrylic coating, liquid wallpaper hardens and is absolutely impervious to moisture. 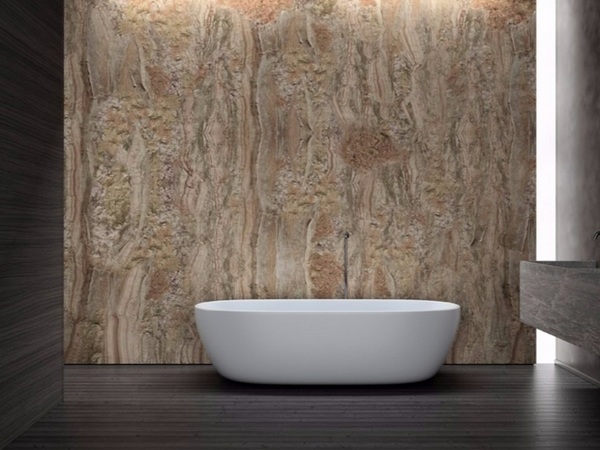 This is a great option for bathrooms as the wall finish has no borders and perfectly hides minor wall surface defects. Fiberglass wallpaper is made of quartz sand, limestone, dolomite and soda, and then it is woven. Depending on the method of manufacture, they can have both a smooth and a relief surface. This option offers the highest water resistant properties and in addition, it does not cause allergic reactions, does not retain dust and does not emit harmful and toxic substances. Fiberglass is a material that promotes air circulation. Therefore, mold and fungus do not appear on the walls. Fiberglass wallpapers are exceptionally durable, they can be installed on any surface and will retain their appearance for many years. In addition, they are easily repainted with water-based paints or latex paints and such wallpaper can be repainted up to 20 times. Installation requires extra caution so if you plan a DIY project, carefully read the instructions and use gloves and long-sleeved clothing. It is best if you trusted this task to a professional as the installation requires some knowledge and experience. 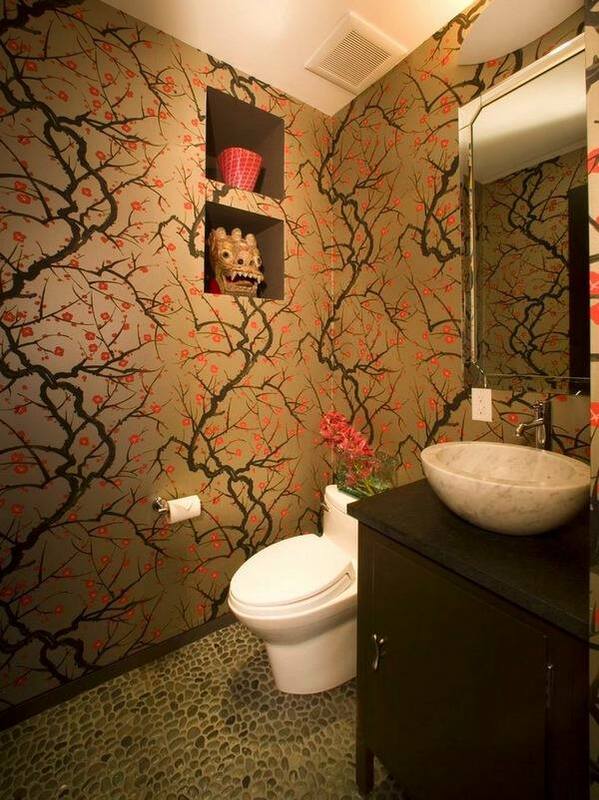 Wallpaper in the bathroom is the best way to create an accent wall and a focal point. 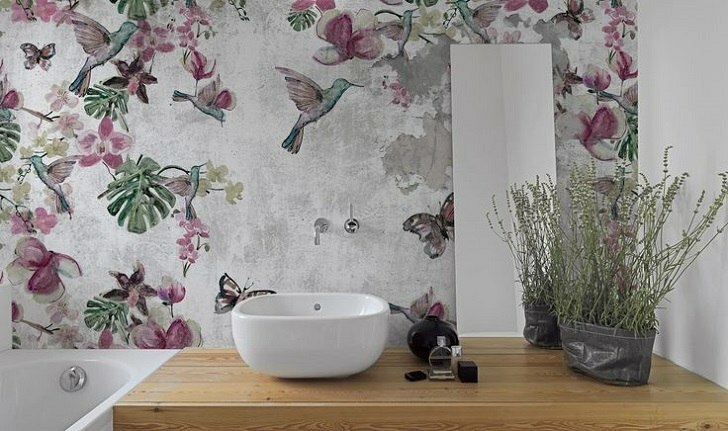 Before choosing the bathroom wallpaper you need to keep in mind that it is important to choose wallpaper which is suitable for the design style, avoiding excessive textures and colors as this will create an impression of clutter and chaos. It is necessary to take into account the budget for the bathroom design or renovation as it affects the choice of materials and finishes. Washable or self-adhesive wallpaper is the option when you work on a tight budget. Liquid, vinyl, and fiberglass are high end alternatives which come at a higher price, so they will require a bigger budget. 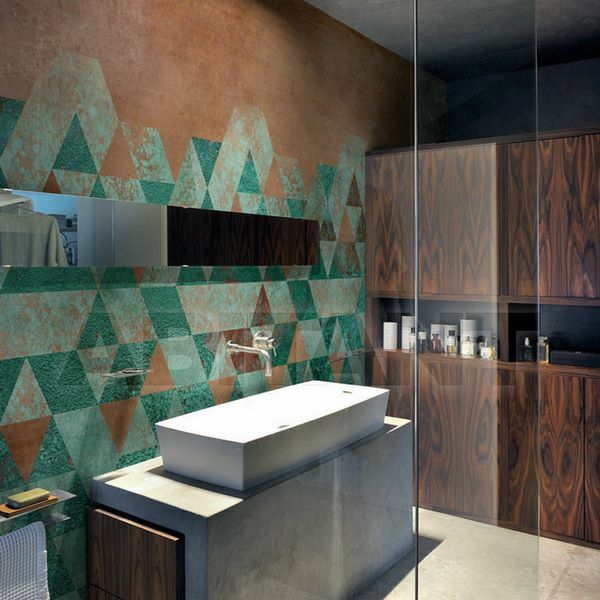 Remember that wallpaper in the bathroom means that it should work harmoniously with other surfaces and materials – ceramic tiles, mirrors, wood, stone, metal, etc. For a modern interior, liquid wallpaper or fiberglass is suitable while for more traditional interiors it is better to choose washable vinyl wallpaper. Photo wallpapers are also very popular and a 3D pattern or a panoramic image allows you to create a unique interior. A floral print combined with white walls makes the room fresh and comfortable and is a great choice for Shabby chic, rustic and traditional designs. 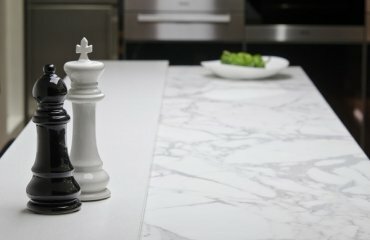 You can use interesting ideas and combine the materials and finishes. This will allow you to create original and visually interesting interiors and at the same time, save considerable amount of money. The most common combination is wallpapers and tiles. 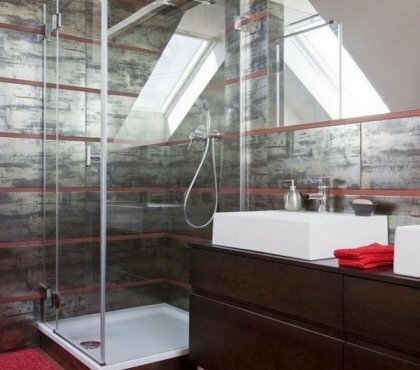 Most often, tiles are installed around the sink and bathtub and wallpaper is hung above them. 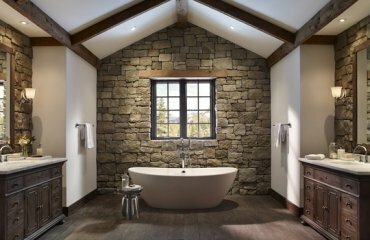 Wallpaper and wood or stone is a great combination and this is an appealing option for people who prefer environmentally friendly interior with a unique design. 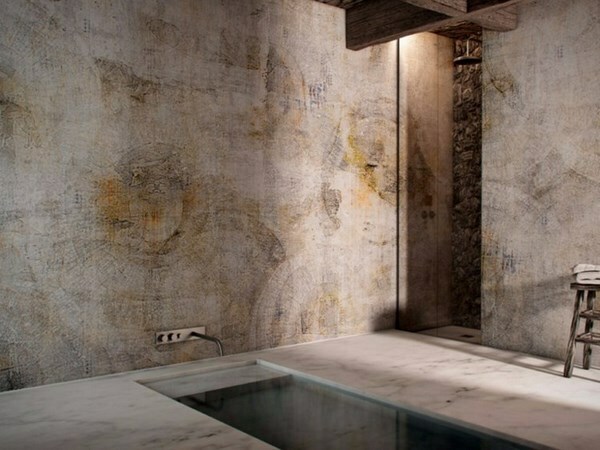 Liquid, vinyl or fiberglass wallpaper work best with natural materials and you can choose a model of color and texture. 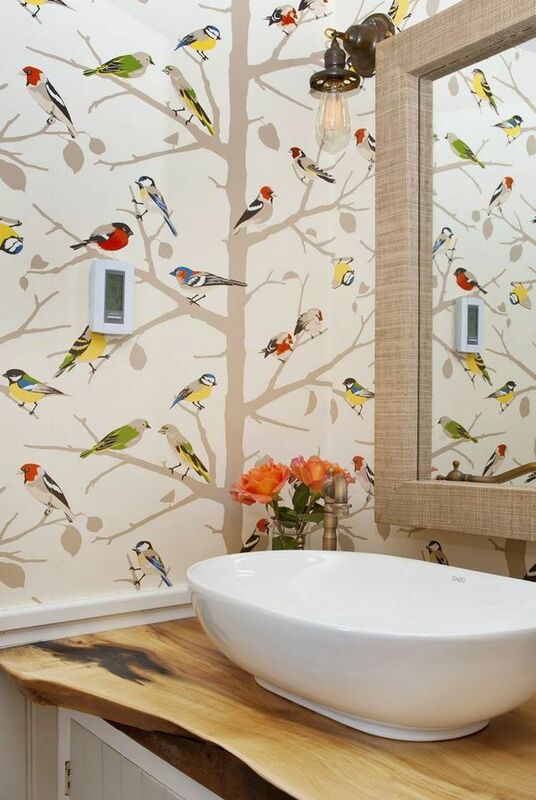 Wallpaper works harmoniously with plastic wall panels as well. This is a low cost, practical and easy to maintain solution. Usually the lower part of the walls is paneled and the upper part is decorated with wallpaper. 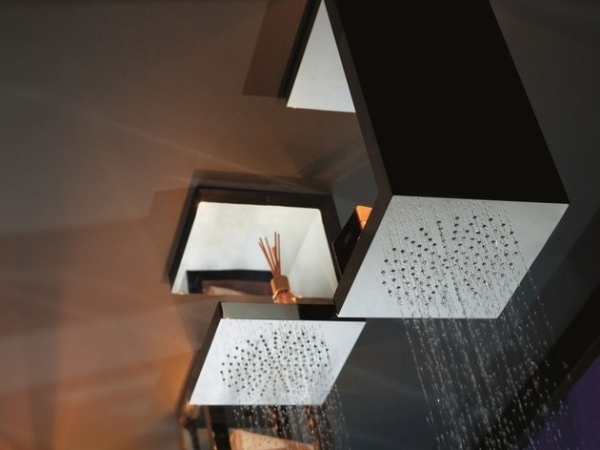 Optionally, you can only use panels in close proximity to water, and hang wallpapers on the dry areas. When choosing a wallpaper you should pay attention to the color. 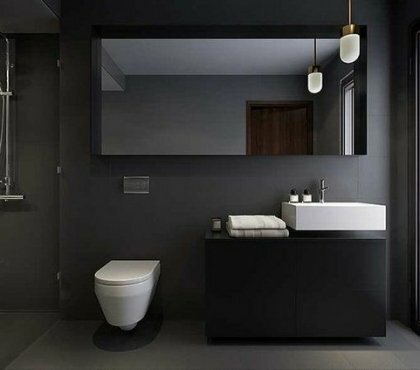 In small bathrooms, dark colors should be avoided as they make the room visually smaller. Pastel colors like beige, peach, cream, etc. are universal and blend well with other colors. They also bring peace and harmony and allow you to visually expand the space. Turquoise and blue shades allow you to emphasize the depth of the design, this color palette is pleasant to the eyes and does not cause irritation. 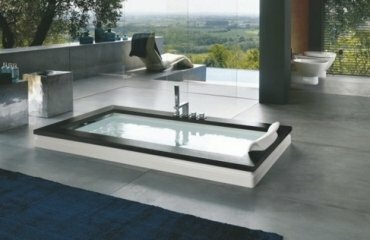 Gray is fashionable and will add a modern touch to the bathroom design. Wallpaper and tile, bricks, wainscoting, wall panels, etc. 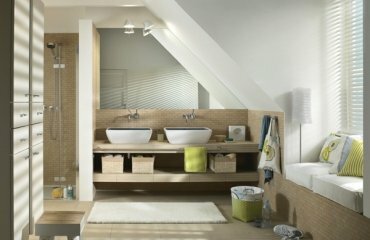 – there are many solutions and creative ideas for unique bathroom interiors. See the magnificent examples in the gallery below and find the idea that suits you best.